Cat Ellen May 13, 2014 January 19, 2015 No Comments on So What Is Tribal Fest, You Ask? So. That happened. Be careful when you take classes… sometimes you end up on stage. http://youtu.be/ZlVXP02F7U0 (you can see me, starting at 9:35 in the video). Many of my bellydance friends already know about Tribal Fest. But not all of my astute readers do, so allow me to introduce this amazing event. For my SCA friends: picture the reputation of Pennsic. If you are local to Pennsic, you *always* try to attend. If you live far away, it can become like your trip to Mecca. SCA camping for one to two weeks in Pennsylvania with “several thousand of your closest friends” (over 10K many years) is an experience like none other. The classes and workshops, the shopping, the pageantry, the war battles with thousands of warriors in each army: *THAT* is Pennsic. You travel with friends, you see old friends from years of events together, you build new memories each year. It is the largest SCA family reunion we have. Now picture something not *quite* so large, but more on the scale of hundreds. Hundreds of bellydancers, in every form of tribal dance (ATS, FCBD, BSBD, ITS, SGI, and other acronyms… Fusion, Indian influenced, Turkish, Improv Synchronized, Theatrical, Vintage)…. All taking workshops together Tuesday through Sunday, and non stop performances Friday through Sunday. Three lawns filled with merchants, several community center buildings of classes and merchants, a meet and greet, and amazing camaraderie that brings us back year after year. There are dancers from nearly every continent. There are almost 200 acts on the stage over three days. And the community of friends. Just stunning. And here I am now, safely in a hotel with an amazing woman that I met four years ago when I first took a class from her. Tomorrow I will be in her class again, for the 4th time. I rode up with a lovely carpool buddy I met just in a workshop, two months ago. Tomorrow, another hotel buddy will arrive who was one of the first ATS dancers I ever saw perform, and honestly one of the dancers that made me think, “I can *do* this.” And I have the amazing good fortune to spend all week with these good folks. 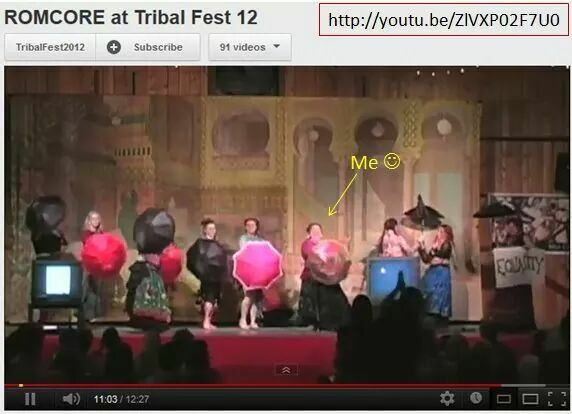 Tribal Fest is my bellydance family reunion. And I couldn’t be happier to be included in this family.